We discuss research, theory and current issues in the fields of health and physical education in an easy to understand way. Our aim is to make research accessible to educators and university students from all over the globe. This episode is a recording of a 12-minute research talk I gave at the AERA annual meeting in Toronto in early April 2019. It highlights a systematic review of literature we (Risto Marttinen, Steve Silverman, Dillon Landi, and Dario Novak) conducted of over 20years of research on teaching in PE. We found 1,023 articles across that time period and coded each one for several items. The almost 700hrs of work is condensed into 12minutes...enjoy! The paper resulting from this study is not yet published. 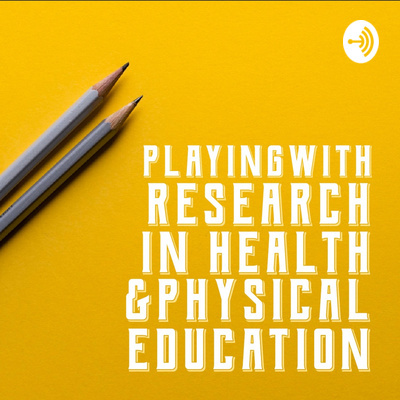 This episode recaps the "SIG 93: Research on learning and instruction in physical education" Invisible College. A pre conference session at AERA for collaborative and interactive sessions. Hosts Risto Marttinen (@ristomarttinen) and Sara Flory (@saraflory) discuss and breakdown these sessions. This podcast gives an overview of the sessions held in Toronto at the 2019 AERA Annual Meeting. The sessions highlighted are from the PE SIG 93. If you are NOT a member, we highly recommend you becoming one. This podcast is with Risto Marttinen and Sara Flory. The Annual Portal for reviewers is open for AERA 2020 in San Fransisco. The abstracts for both the invisible college and SIG 93 submissions will be due in late July 2019 for the AERA conference in San Fransisco (April 17-21). This episode gives an explanation of how to develop and validate a quantitative instrument. No, you can't just make one up and send it out and get reliable results! This is a great basic overview of what it takes to make a valid and reliable scale/instrument for research purposes. Dr. Cassandra Iannucci (@cassamariab) gives an overview of the process, more detailed information is available in the article. Iannucci, C., MacPhail, A., & R. Richards, K. A. (2018). Development and initial validation of the Teaching Multiple School Subjects Role Conflict Scale (TMSS-RCS). European Physical Education Review, 1356336X18791194. This podcast discusses how two teachers in the UK used flipped learning (flipped classrooms) and integrated digital technologies into their teaching. Dr. Julia Sargent (@julia_sargent) is a lecturer at The Open University in the UK. She looks at digital pedagogies and how digital technology can support learning and learning materials. Prior to this role, Julia completed her PhD at Loughborough University in Physical Education and Sport Pedagogy. She explored how and why physical education teachers' used digital technology. Her research interests include digital technology, teaching, learning, strengths-based approaches and practice-based research. Julia is an AFHEA and has taught on a number of research methods modules. Citation for article: Sargent, J., & Casey, A. (2019). Flipped learning, pedagogy and digital technology: Establishing consistent practice to optimise lesson time. European Physical Education Review, 1356336X19826603. This episode talks about touch in physical education, about a moral panic, surveillance and how physical touch is navigated by pre-service teachers in Spain which is a "touchy" culture. Valeria Varea has completed her PhD at the School of Human Movement Studies at the University of Queensland, Australia (title: The body as a professional ‘touchstone’: Exploring Health and Physical Education undergraduates’ understandings of the body). She was then appointed as a lecturer in Health and Physical Education at the University on New England, Australia. In 2018, she left Australia to to work as an associate senior lecturer at the School of Health Sciences at Örebro University, Sweden. Valeria's research draws on critical and socio-cultural perspectives, using qualitative research methods to extend knowledge and critique people's understandings of the body, health, Physical Education, sport and physical activity. https://www.oru.se/english/employee/valeria_varea Varea, V. , González-Calvo, G. & Martínez-Álvarez, L. (2018). Exploring Touch in Physical Education Practicum in a Touchy Latin Culture. Societies, 8 (3). This paper discusses the story of Grace, an elementary PE teacher, and the ways in which she navigated her working environment as the teacher of a marginalized subject. The podcast covers the strategies Grace utilized in her career. Dr. Karen Lux is the PETE Program Coordinator at The University of New Mexico in Albuquerque. Citation: Lux, K., & McCullick, B. A. (2011). How one exceptional teacher navigated her working environment as the teacher of a marginal subject. Journal of Teaching in Physical Education, 30(4), 358-374. Senlin Chen, Ph.D., is a Helen “Bessie” Silverberg Pliner associate professor in the School of Kinesiology at Louisiana State University. Dr. Chen’s research is focused on physical education curriculum intervention, youth physical activity and fitness promotion, motivation and learning in physical activity. Dr. Chen is a Fellow of the Research Council of Society of Health and Physical Educators (SHAPE America), he was the recipient of the 2016 Young Scholar Award from Western Society for Kinesiology and Wellness (WSKW) and the 2016 Early Career Research Excellence Award from the International Chinese Society for Physical Activities and Health (ICSPAH) among other awards. The full cite for the article: Chen, S., & Gu, X. (2018). Toward active living: comprehensive school physical activity program research and implications. Quest, 70(2), 191-212. This conversation is with Dr. Jaimie McMullen (@DrJMcM) who is an associate professor at UNC in sport pedagogy. Risto and Jaimie discuss the program at UNC, and what a PhD in PETE looks like as well as a comparison to an Irish/UK system of PhD. This episode gives an introduction to the Tactical Games Approach model that stemmed from Teaching Games for Understanding (TGfU). Risto Marttinen is an assistant professor at George Mason University in Virginia, USA. You can find him on twitter at the innovative handle of @RistoMarttinen Risto runs an integrated after-school sports and literacy program called REACH. He has conducted research on this program over the past four years. www.reachafterschool.org Risto's research interests include after-school physical education curriculum serving youth in under-resourced communities, student attitudes, research on teaching in physical education, and the integration of academic subjects into physical education. Original works on this model: Griffin, L. L., Mitchell, S. A., & Oslin, J. L. (1997). Teaching sports concepts and skills: A tactical games approach. Human Kinetics Publishers (UK) Ltd. Griffin, L. L., & Butler, J. (2005). Teaching games for understanding: Theory, research, and practice. Human Kinetics. and the Metzler curriculum book: Metzler, M. (2017). Instructional models in physical education. Routledge. Dr. Kevin A. Richards @KARRichards14 talks with Risto about the recent monograph in JTPE. Discussion is on undergraduate recruitment, retention, marketing of PETE programs, the state of Doctoral Programs, teacher shortages in PE, alternative licensing programs and many more. This is a MUST read monograph for anyone involved in PETE. Citation to one part of the monograph: Templin, T. J., Graber, K. C., & Richards, K. A. R. (2019). Chapter 9: Will PETE Survive in the 21st Century?. Journal of Teaching in Physical Education, (00), 1-7. This podcast discusses policy, but not the boring type, the type that talks about those who enact it…teachers! This paper won the PESP best paper for 2017. Dr. Laura Alfrey explains why enacting policy doesn't always work as the writers intended through the lens of 3 teachers. Episode 22 gave a background on how critical inquiry is embedded into the Australian Curriculum. Laura (twitter @LauraAlfrey) is a Senior Lecturer within the Faculty of Education at Monash University, Australia, with her main responsibilities relating broadly to Health and Physical Education. Her research has inclusion and teacher professional learning as it's central threads. Recent publications have explored phenomena such as fitness testing as a context for learning, critical inquiry, and stereotypes in Physical Education. Cite for article: Alfrey, L., O'Connor, J., & Jeanes, R. (2017). Teachers as policy actors: Co-creating and enacting critical inquiry in secondary health and physical education. Physical Education and Sport Pedagogy, 22(2), 107-120. This podcast discusses care experience youth (youth in foster care, group homes, shelters etc) and their value and use of leisure time activities. This paper pulls from Positive Youth Development (episode 19), and the social ecological model (theory breakdown 3). Tom is a Senior Lecturer in Physical Education (PE) and Sport Pedagogy. His research explores the role of sport and PE for youth from socially vulnerable backgrounds, specific care experienced children and young people. Following his PhD in 2011, Tom worked as the ‘Educational Review’ Post-doctoral Research Fellow, and later as a Lecturer in Sport, at the University of Birmingham. While completing his doctoral studies in August 2010, Tom was presented with the AIESEP Young Scholar Award at the AIESEP World Congress in La Coruna, Spain. Tom moved to Leeds in 2012 as a Senior Lecturer in Physical Education and Sport Pedagogy. You can follow Dr. Quarmby on twitter @DrTomQ The cite: Quarmby, T., Sandford, R., & Pickering, K. (2018). Care-experienced youth and positive development: an exploratory study into the value and use of leisure-time activities. Leisure Studies, 1-15. This podcast discusses how PYD finally has a model that is sport-based that was developed through a meta study that Dr. Holt explains. Dr. Nick Holt is a Professor and Associate Dean (Research) at the University of Alberta in Edmonton, Canada. He leads the Child & Adolescent Sport & Activity (CASA) lab. Their research examines psychosocial aspects of sport and physical activity participation among children, adolescents, and their families. Dr Holt also works on the Positive Youth Development (PYD) Through Sport: PYD SportNET Project Funded by the Social Sciences and Humanities Research Council of Canada (SSHRC), this project involves creating a network of evidence-based resources designed to promote PYD in Canadian sport. Twitter @PYDsportNET Check out their website www.positivesport.ca The open access citation for this paper can be found by clicking https://www.tandfonline.com/doi/full/10.1080/1750984X.2016.1180704 Full cite: Holt, N. L., Neely, K. C., Slater, L. G., Camiré, M., Côté, J., Fraser-Thomas, J., ... & Tamminen, K. A. (2017). A grounded theory of positive youth development through sport based on results from a qualitative meta-study. International review of sport and exercise psychology, 10(1), 1-49. This episode discusses Dr. Nick Washburn's article (in press) titled “Enhancing Student Learning in Sport Education through the Manipulation of Need-Supportive Instruction” Dr. Washburn is beginning his second year as an Assistant Professor of Secondary Physical Education and Health at Western Washington University. He has a passion for facilitating future teachers' professional development from both scientific and dispositional perspectives. Follow him @nickwashburn12 on twitter. This episode discusses a paper by Dr. Stephen Harvey on PE professionals use of Twitter. Dr. Stephen Harvey is an Associate Professor in Sports Coaching at Ohio University. His main research interest surrounds game-based approaches to teaching and coaching. However, his work in coaching has additionally been focused on the systematic observation of coaching behavior, and how coaching behavior is tied to coaches' biographies. Dr. Harvey has maintained an interest in educational technology and co-developed an app (Axis Coaching) that a trained observer can use to investigate and record coaches' behavior. Finally, Dr. Harvey's interest in educational technology has led to him researching with and about teachers and coaches social media use. You can find him at: Twitter: @drstephenharvey Email: harveys3@ohio.edu Voxer: sharvey7402 www.drstephenharvey.weebly.com The citation is: Harvey, S., & Hyndman, B. (2018). An Investigation into the Reasons Physical Education Professionals Use Twitter. Journal of Teaching in Physical Education, 37(4), 383-396. This podcast breaks down an article about females with visual impairments in PE. Justin A. Haegele, PhD, CAPE, is an assistant professor in the Department of Human Movement Sciences and teaches in the Health & Physical Education program area. His research and teaching interests are in adapted physical education/activity and inclusion. In addition to his work at ODU, he also is the co-director of Camp Abilities Alaska, a one-week development sport camp for youth with visual impairments. In 2012, Dr. Haegele was honored as the New York State Adapted Physical Education Teacher of the Year. More recently, he was selected as the first recipient of the David P. Beaver Adapted Physical Activity Youth Scholar Award, awarded by the National Consortium of Physical Education for Individuals with Disabilities (2015). Twitter: @justin_haegele The full citation: Haegele, J. A., Yessick, A., & Zhu, X. (2018). Females With Visual Impairments in Physical Education: Exploring the Intersection Between Disability and Gender Identities. Research quarterly for exercise and sport, 89(3), 298-308. This podcast introduces the Teaching Personal and Social Responsibility (TPSR) model. Dr. Wright introduces the model that was created by his mentor Don Hellison. This impactful model has been widely researched and is one of the core curriculum models being implemented in physical education. This podcast aligns with Episode 13 as Dr. Wright discusses the TARE instrument that was designed to measure practice that uses TPSR. Dr. Wright is a professor at Northern Illinois University and specializes in the Teaching Personal and Social Responsibility (TPSR) instructional model. His scholarship is very applied and relates directly to fields such as positive youth development, social and emotional learning, and sport for development. He also has interests in policy and program evaluation as it relates to youth sport and physical activity. Dr. Paul Wright discusses an instrument he developed to assess responsibility-based education and the TPSR model more broadly. A separate theory breakdown is posted on TPSR with this article. Dr. Wright specializes in the Teaching Personal and Social Responsibility (TPSR) instructional model. His scholarship is very applied and relates directly to fields such as positive youth development, social and emotional learning, and sport for development. He also has interests in policy and program evaluation as it relates to youth sport and physical activity. The full citation: Wright, P. M., & Craig, M. W. (2011). Tool for assessing responsibility-based education (TARE): Instrument development, content validity, and inter-rater reliability. Measurement in Physical Education and Exercise Science, 15(3), 204-219. This podcast describes the continuing work on the SWITCH program out of Iowa State University. It is a whole-school wellness program that encompasses way more than PE, and has years of research behind it. We talk with Dr. Gabriella McLoughlin who is currently a post-doctoral research associate in the department of Kinesiology at Iowa State University. Her research focuses on children’s physical activity and health promotion, specifically targeting the school environment through comprehensive interventions. She is a licensed K-12 Physical Education Teacher and seeks to enhance the status of physical education as an integral aspect of the school curriculum and as a means to cultivate health-promoting school environments. She is currently working with Dr. Greg Welk and other professors at Iowa State and other institutions to deliver the School Wellness Integration Targeting Child Health (SWITCH) study (as described in the podcast), which is funded by the United Stated Department of Agriculture (USDA) and the National Institutes of Health (NIH). In addition she works to evaluate the NFL Fuel up to Play 60 program in conjunction with FitnessGram research and the Cooper Institute, conduct lab-based studies integrating measurement of physical activity, and works with physical education teachers across the state of Iowa to enhance their use of assessment and data-based decision making. This podcast covers a new model of Restorative Youth Sport developed by Dr. Hemphill and colleagues that pulls from TPSR and Restorative Practice. Dr. Michael Hemphill is an assistant professor at UNC-Greensboro. His research focuses on teaching personal and social responsibility through sport, physical activity, and physical education with specific applications to urban communities and professional development programs for physical activity providers. TPSR Alliance: https://sites.google.com/uncg.edu/tpsr-alliance/home The full citation: Hemphill, M. A., Janke, E. M., Gordon, B., & Farrar, H. (2018). Restorative Youth Sports: An Applied Model for Resolving Conflicts and Building Positive Relationships. Journal of Youth Development, 13(3), 76-96. Dillon Landi is an assistant professor at Towson University in the USA. He specializes in research on health, physical activity, and education. In addition, his work encompasses critical social theories, curriculum and teaching, and research methods. Prior to Towson, Dillon was a faculty member at The University of Auckland (New Zealand) where he is also enrolled as a PhD candidate. His PhD analyzed the role of health and physical activity in educational settings on gender and sexuality diverse youth in Aotearoa New Zealand. There is a theory breakdown podcast that launched simultaneously with this on New Materialism. The citation for the paper: Landi, D. (2018). Queer men, affect, and physical education. Qualitative Research in Sport, Exercise and Health, 1-20. Episode 8 is our first "special topics" episode. So, instead of highlighting one specific article and discussing the paper we have a conversation about the topic in general and pull from various sources. These are going to be less structured and more free-flowing. This episode is a continuation of Episode 6 with Justen O'Connor and Dillon Landi. We discuss issues in youth sports, informal sports and the future of participation in PA.
Risto and Dr. Erin Centeio discuss a comprehensive school health program that was successful in preventing obesity in elementary schools. A great insight into what a comprehensive school program looks like in real life. This paper was published in 2018 in Preventative Medicine. Citation: Centeio, E. E., McCaughtry, N., Moore, E. W. G., Kulik, N., Martin, J., Shen, B., … Fahlman, M. (2018). Building healthy communities: A comprehensive school health program to prevent obesity in elementary schools. Preventive Medicine, 111, 210–215. BRIEF BIOGRAPHY Erin E. Centeio, Ph.D., is currently an Assistant Professor at the University of Hawaii at Manoa. Erin has conducted research that focuses on increasing children’s levels of physical activity throughout the school day and understanding the effects this has on their health, as well as the cognitive and psychosocial benefits. Dr. Justen O'Connor is a Senior Lecturer at Monash University in Melbourne, Australia. Dillon and Risto talk with him about his co-authored article about informal sport. This was so fascinating for us we kept talking after and will release that as a separate episode on youth sport and informal sport. Citation: "Jeanes, R., Spaaij, R., Penney, D., & O’Connor, J. (2018). Managing informal sport participation: tensions and opportunities. International Journal of Sport Policy and Politics, 1-17." Justen's Bio Justen has research experience that utilises systems thinking, social ecology and strengths-based approaches to explore curriculum and pedoagogy associated with health, physical education, sport and lifetime physical activity. Justen also has an interest in social justice within education as well as informal forms of participation in movement. Justen is fluent in both quantitative and qualitative research methods and has expertise in designing scales for measurement. Teacher Socialization Theory is a process in which teachers are recruited in to, prepared for, and continuously socialized through their lives and careers in school settings. This theory breakdown episode by Dr. Kevin Richards explains the theory for you. This episode is launched side by side with an article breakdown of a paper by Dr. Richards and his colleagues which uses this theory. Dr. Sara Barnard Flory is as associate professor with the University of South Florida. Our conversation was about the professional socialization of urban physical educators. It's a great insight into urban physical education and explains culturally responsive pedagogy in physical education. Much of her research revolves around preparing teachers for culturally diverse school settings, social justice in PE, and the role of culture in PE. The full citation of the article is: Flory, S. B. (2016). Professional socialization experiences of early career urban physical educators. European Physical Education Review, 22(4), 430-449. Dr. Ash Casey is with Loughborough University in the UK. We discuss his 2014 paper on models based practice in physical education. A good conversation to the question: are models the great white hope or a white elephant? This paper is Dr. Casey's 2nd highest cited article and has been read widely. Dr. Casey continues to publish and conduct research on this topic and has more recent papers out discussing models. We wanted to highlight this paper first as it provides a great overview of models and can lay the foundation for future podcasts on this topic. During the month of September the article (citation below) will be open access courtesy of Routledge Ed. Casey, A. (2014). Models-based practice: Great white hope or white elephant?. Physical Education and Sport Pedagogy, 19(1), 18-34. Dillon and Sara interview Dr. Vicky Goodyear in Scotland about the use of FitBits in PE classes and how students experienced technology in PE. The paper discusses the students' perceptions of surveillance by the FitBit and expands on how students began to resist the implementation. Great conversation about some of the unexpected effects of technology integration and highlighting student voice. Dr. Goodyear is at the University of Birmingham UK and conducts research with young people and the uses of technology and the impact of social media among other topics. The full citation of the article is: Goodyear, V. A., Kerner, C., & Quennerstedt, M. (2017). Young people’s uses of wearable healthy lifestyle technologies; surveillance, self-surveillance and resistance. Sport, education and society, 1-14.